This chart is intended to provide a profile on press providers. While we have done our best to post accurate information the chart will be updated or corrected over time. A high level historical overview. The intent is to educate users of all type of presses on the options you have when selecting your next, stamping, forming, mechanical, hydraulic or forge press. SUTHERLAND PRESSES: Sutherland was founded in California in 1946 after WW-II primarily as a distributor of coil steel to the Western states manufacturing and metal forming industry. Jack Sutherland started to import master steel coil from NKK / Nippon Kokan Steel in the mid 1950’s. The master coils were then shipped back to California where they were processed and slit to size to meet the users requirements. During Jack’s pioneering efforts in Japan he was introduced to Aida Engineering and an agreement was reached for Sutherland to import and distribute Aida presses in North & South America. (see comments above / Aida). In 1980, Mark Sutherland took the helm at Sutherland and in 1985 decided to contract press building under the private label of Sutherland Presses. 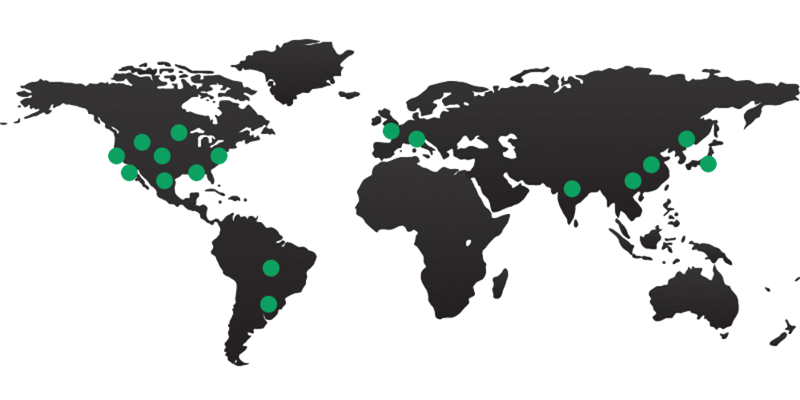 We are well known in the Pacific Rim Triangle (Japan-Taiwan-China) and only use suppliers that can meet or exceed our standards and JIS 1st class standards. We are nimble, innovative and only influenced by the best in press building. The results are quality lines of presses for mechanical presses, hydraulic presses and forge presses. We encourage you to speak with our customers about our products and services. We also encourage you to learn about our I-PRESS AB PLUS press and automation control, the most fully featured control available today. AIDA PRESSES: Aida was founded in Japan in 1917 and is one of two major mechanical stamping press makers in Japan. Aida builds a wide range of presses from gap frame, large straight sides and forge presses. Jack Sutherland was the original importer (1960) to North America of Pacific Rim made presses made by Aida. Sutherland invested 25 years in growing the Aida brand in North America with good success. In the mid 1980’s Sutherland choose to private label its own line of presses under the Sutherland name. Sutherland was heavily influenced by Aida and has improved upon some of Aida’s designs. SCHULER / BCN / BLISS / YADON PRESSES: Schuler was founded in Germany in 1939 and is Germany’s largest press builder. Schuler along with Aida & Komatsu are the three main builders that Sutherland monitors and tracks new innovations and press technology. Schuler is well known for its quality and specializes in larger press projects. Mueller Weingarten acquired the assets of CNB / Clearing-Niagara-Bliss and formed BCN Technical Services/Bliss-Clearing-Niagara for the parts and service business in 2006, which was then acquired by Schuler in 2010. In 2014 Schuler purchased a Chinese press builder, Yadon with the intent to gain market share in China. KOMATSU: Komatsu Press Division was founded in Japan in 1924 and is the second largest press builder in Japan. Like Aida, Komatsu focused on quality and innovation and introduced the eccentric drive with plunger guided slide. Sutherland has adopted an improved the eccentric drive with double pitman and plunger guided slide in our EHW Series line of two point straight sides. We do recognize Komatsu for quality products, but they seem to be most focused on the servo press technology which only fits a small portion of the industry’s needs. STAMTEC / CHIN FONG PRESSES: Chin Fong was founded in Taiwan in 1948. As you can tell by the founding dates of the Japanese & Taiwanese builders, most of the press technology was copied from both Aida & Komatsu in Japan. Chin Fong was first imported into NA under the name of Stamtec by Timco Industrial Machinery in TN. Sutherland did join the efforts of Timco and reached an agreement that Sutherland would handle West of the Mississippi. This relationship did not last more than a few years, as Sutherland was focused on all of North America. This led Sutherland to Seyi / Shieh Yih who agreed that Sutherland would be the exclusive private label agent. SEYI / SHIEH YIH PRESSES: Seyi (Shieh Yih & Seyi America) was founded in Taiwan in 1962. In 1985 Mark Sutherland & Robert Heller created a JV, Heller-Sutherland Presses with the intention of serving all of NA & SA markets. Sutherland bought out Heller in the late 1980’s. While Seyi quality from the starting point did not meet our expectations, we saw an opportunity to work with Seyi engineers to bring them up to our industrial standards. This was a much larger undertaking than we had thought, but over a 12 year period from 1985 to 1997, we gained serious market share and installed over 700 press lines. In 1997, the Asian crisis was crippling Seyi sales in the Asian markets. They owners at the time, came to Sutherland and requested that we make a 3 way JV, Sutherland, Seyi & CNB (Clearing Niagara Bliss). Sutherland rejected the idea and was not about to let CNB ride on our success of 700 press line installations. 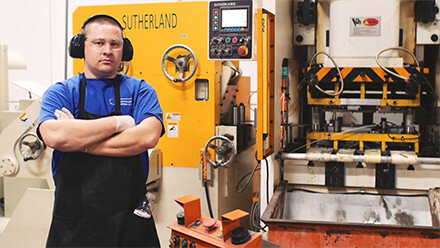 Sutherland terminated its agreement with Seyi, notified all 27 customers with machines in process that they could stay with Seyi or move with Sutherland to our alternate builder, all 27 customers elected to stick with Sutherland. CLEARING / NIAGARA / BLISS / CNB PRESSES: Bliss, Clearing & Niagara were all separate major press builders in NA for many decades. Bliss was taken over by Gulf & Western and after a number of years was closed. Clearing was closed due to the onslaught of foreign competitors. Niagara was purchased by a former Verson employee who then formed CNB / Clearing Niagara Bliss after acquiring the assets of Clearing & Bliss. As shown above (Seyi) CNB management was on an industry disruptive downward spiral and hoped to join in the rewards of Sutherland success with over 700 press lines sold by Sutherland. The end result for CNB was bankruptcy. Currently the assets are owned by what is now called BCN / Bliss-Clearing Niagara which is now owned by Schuler Presses. No new presses are being built at this time by, Bliss, Clearing or Niagara. BECKWOOD: Beckwood has approximately 40 years of history in building smaller bench top, C-Frame hydraulic presses and more recently has graduated into medium tonnage presses. New addition includes the Triform line which includes fluid cell and sheet hydroforming. MACRODYNE: Macrodyne indicates it has established a reputation over the past few decades as a builder of heavy duty hydraulic presses, press lines and die handling equipment. The company is based in Ontario, Canada.